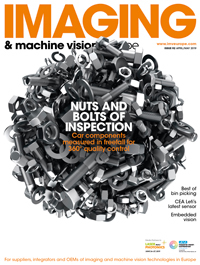 The North American machine vision market has shown record performance in the first half of 2017, demonstrating sales totalling $1.241 billion – an increase of 11 per cent year-over-year – according to research conducted by the Association for Advancing Automation (A3). The figures follow a successful first quarter in North America, which saw sales increase 10 per cent year-over-year to $597 million. Machine vision component sales rose 11 per cent in total to $177 million, while systems sales increased 10 per cent to $1.058 billion over the first half of 2017, A3 reported. Other notable growth rates included the lighting market increasing 20 per cent to $35 million, the smart camera market increasing 16 per cent to $183 million, and the optics market increasing 16 per cent to $20 million. Experts, according to A3, expect software to trend up, cameras, lighting, and imaging boards to remain flat, and optics to trend down over the next six months. It is also expected that application specific machine vision (ASMV) systems will increase, and that smart cameras will remain flat over the next two quarters. The North American robotics market also experienced a record beginning to the year, demonstrating sales of approximately $1.031 billion and 19,331 robots sold, A3's research also concluded. These figures represent a growth of 26 per cent in dollars and 33 per cent in units sold. Robot orders relating to the automotive industry also grew substantially, increasing 37 per cent in dollars and 39 per cent in units sold, while non-automotive orders grew 10 per cent in dollars and 21 per cent in units sold. A3’s research also covered the North American motion control and motors market, reporting orders amounting to $1.622 billion over the six-month period, up 14 per cent year-over-year. Shipments totalling $1.757 billion were made – up 10 per cent year-over-year – with the fastest growing categories being: motion controllers, which increased 21 per cent to $97 million; sensors and feedback devices, which increased 20 per cent to $76 million; actuators and mechanical systems, which increased 17 per cent to $318 million; and AC drives, which increased 17 per cent to $199 million.